Daily Illuminator: You Need Arenas! September 23, 2013: You Need Arenas! 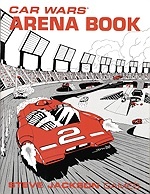 How jam-packed was the classic Car Wars Arena Book? It had no back cover text . . . because that space was filled up with useful counters! Newly released to e23, this supplement includes 14 arenas. Three are ready-to-print, while 11 are drawn at a quarter-sized scale, waiting for you to sketch on any oversized map sheets you have. Taking advantage of the digital realm, the three full-sized arenas are offered as single-page versions (for those with access to gargantuan printers) and split versions (for those with more traditional home printers). Each arena also includes events and tactics held there . . . and did we mention the counters? With Car Wars Arena Book, you've got over a dozen ways to earn fame and fortune -- all with ample and convenient parking!